We already talked about the plan for our temporary floor renovation, and the floor certainly isn’t the only thing we’d like to change about this kitchen. Unfortunately, we’re not financially in a position to do the “big” kitchen renovation we want this year, which is what we’d originally planned on. So we’re going for a mini renovation (< $500) to tide us over. What are the short term and long term plans for different things in this kitchen? The appliances are barely working – there is something broken on each of them, and I fear they’re not long for this world. We’re just hoping they hold out until we can afford to replace them all at once. 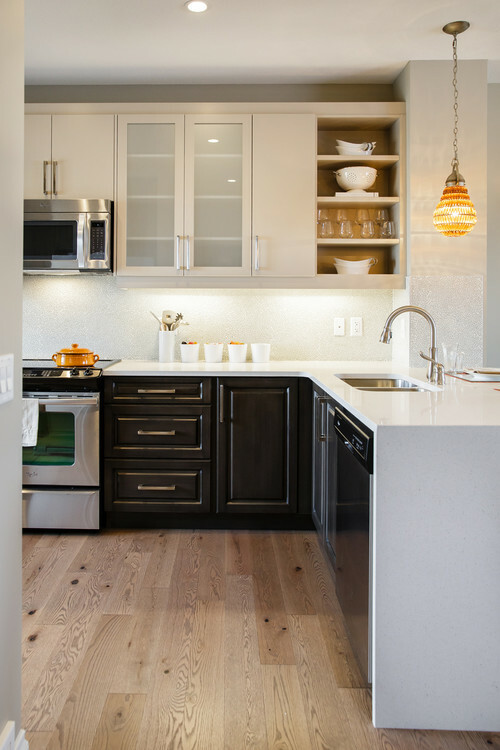 The layout of the room is awkward – the space in the back is approximately 35% of the square footage of the kitchen, and it’s not well utilized due to the layout of the counters and the placement of the door. Short Term: we’ll be trying to make-do with this layout by putting some functional storage on the back wall. The cabinetry is likely original to the 1940s, and is flimsy and coming apart in some sections. Long Term: we’ll replace all of the cabinets, and hopefully add more. We’re considering Ikea for this (we used one of Ikea’s new SEKTION cabinets in our built-in desk as a way to test-drive the line). The gross fake cork floor & restaurant-kitchen-style laminate baseboard is NOT our favorite. An aesthetically questionable maroon-painted soffit, which may or may not house venting for the broken range hood. Long Term: I don’t like it, so if it does contain the venting for the hood, we’ll be looking at different options for ventilation, including placement of the range / vent hood. The current ones are stainless steel, and I don’t mind them; they’re one of the few things I like about the current kitchen, actually. Short Term: Keep ’em in for now! I wouldn’t have picked them on my own, and they are hard to keep clean (always smudges), but they’re sturdy and solid-surface (preferable for sanitation). Long Term: TBD … in my perfect luxe kitchen we’d have marble. But I don’t think that’s realistic (for our life or budget). So we’re open to all options once it comes time for the “real” kitchen reno. So for all of this “short term” work, what are we going for? This hits a lot of our check boxes right now — light “raw” wood floors, dark lower cabinets, light upper cabinets. Obviously our countertop isn’t white quartz, and we don’t have stainless appliances, but…. it’s in the neighborhood, at least. It will almost be like getting more cabinets in the back part of the kitchen. Long term, we do want cabinets back there, but aren’t ready to make that commitment yet, hence a mediocre-quality sideboard to temporarily take that space. Plus, it will give us some (clearly) much needed storage. The dog crates (that we built! – barely visible behind the piece of counter that is sticking out) will go away, since we don’t keep the dogs in there much. Let’s see how much progress we can make this weekend!